North Pacific humpback whales (Megaptera novaeangliae) migrate from temperate low-latitude breeding grounds to high-latitude feeding grounds each summer. The waters surrounding the eastern Aleutian Islands are dominated by strong tidal currents, water-column mixing, and unique bathymetry; these factors are thought to concentrate the small fish and zooplankton that comprise the typical humpback diet in Alaska, creating a reliable and abundant food source for whales in the Bering Sea. While humpbacks are probably the most studied large whales in the world, individual fine-scale habitat use and movement are still poorly understood, particularly in remote regions like the Bering Sea and the eastern Aleutian Islands. Most of what we know about humpback distribution and habitat use has been from analyses of historical whaling data and from modern photo-identification and genetic studies, yet these types of studies reveal only a small fraction of a whale’s behavior. Figure 1. Satellite-tag deployment on a humpback whale off Dutch Harbor, Alaska. Satellite telemetry is being used worldwide to create detailed, fine-scale tracks of whale movement, revealing behaviors that were previously unknown. During summer 2007-11, members of the Cetacean Assessment and Ecology Program deployed satellite-telemetry tags on humpbacks off the coast of Unalaska Island (Fig. 1). These tags are designed to record the animal’s position while at the surface, 12 hours a day for up to several months. The tag data we collected during this study revealed the first fine-scale movement information for humpback whales in a North Pacific feeding ground. Ten satellite transmitters were deployed, yet only eight tags transmitted long enough to be evaluated. The whales were tracked for an average of 28 days (range = 7-67 days). Although all of our study whales were tagged in Unalaska Bay, they showed remarkable variation in speed, direction, and overall distance travelled, both within and between years. In 2007, one of the two tagged whales (21810 2007) made a trip to the Island of Four Mountains and returned to the northern side of Umnak Island, while the other (21809 2007) explored presumed feeding areas to the east of the tagging location between Unalaska Bay and Unimak Pass (Fig. 2). 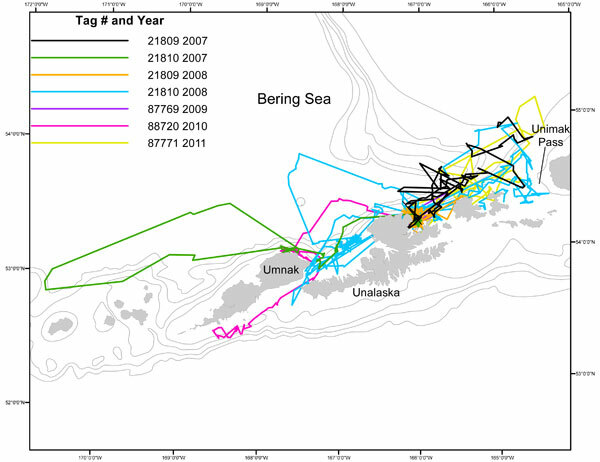 Of the two whales tagged in 2008, one (21809 2008) remained within 50 km of Unalaska Bay for the duration of the tag and the other (21810 2008) travelled nearly three times farther that year, between Unimak Pass and the Pacific side of Umnak Pass (Fig. 2). The single whale tagged in 2009 (87769 2009) remained within Unalaska Bay during the 7 days of tag transmission (Fig. 2). Figure 2. Telemetry tracks for seven humpback whales tagged during summer 2007-11. The two whales tagged in 2010 showed the most surprising variation from any other year. One whale (88720 2010) travelled from Unalaska Bay west to northeastern Umnak Island, then through Umnak Pass, presumably to forage on the Pacific side of the island (Fig. 2). The other animal tagged that year (88721 2010) left Unalaska Bay 3 days after it was tagged and moved at least 1,500 km (in 12 days) along the outer Bering Sea shelf to southern Chukotka, Russia (Fig. 3). After 4 days off the Russian coast, this whale moved east across the Bering Sea basin to Navarin Canyon (60°30’N, 179°20’W), where it remained until transmissions ceased. In all, whale 88721 2010 travelled over 3,000 km, roughly the equivalent of swimming from Seattle, Washington, to Houston, Texas, in 26 days. 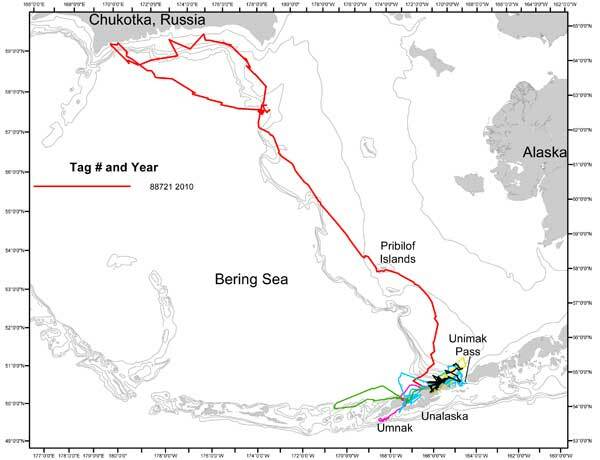 The animal tagged in 2011 (87771 2011) remained nearshore between Unimak Pass and Umnak Pass (Fig. 2) for the duration of the tag transmission. Figure 3. Telemetry tracks for all whales tagged during this study. Note that whale 88721 2010 travelled along the shelf break to coastal Russia before looping back, covering approximately 3,000 km in 26 days. These results support the findings of historical and current studies that humpbacks frequently congregate in shallow, highly productive coastal areas of the North Pacific Ocanand Bering Sea. However, these tracks also make it clear that individual whales are making independent decisions about movement and that these decisions can lead to surprisingly long-distance travel within a feeding season. This movement variation is difficult to predict or describe but could potentially have a major impact on stock structure definitions. Ironically, whale 88721 2010’s trip to the Chukotka coast occurred about a week after a NMFS Biological Review Team, charged with assessing the population structure of humpback whales, had decided that there was population separation between the eastern Aleutian Islands and Russia. Fishing gear entanglement, a well-known cause of injury or death in the North Atlantic humpback population, has already been documented in nearly a quarter of the humpbacks photographed in Alaskan waters. Ship strikes, involving a wide range of vessels, are also increasing in Alaska. Impacts on humpbacks in the eastern Aleutians region and Bering Sea will likely increase with the influx of human activity from newly opened oil and gas lease areas in the Chukchi and Beaufort Seas. This study clearly shows that humpbacks are a highly mobile, multinational species, both within and between seasons. These data should highlight the need for cooperation between North Pacific coastal nations in creating effective research and management strategies that mitigate the known threats to humpbacks throughout all stages of their life cycle. Continued research involving satellite telemetry will help describe how these whales overlap with human activity throughout the North Pacific and will provide domestic and international governments with the information they need to take effective action against those threats.